This is an easy and shady slot canyon hike in the Grand Staircase-Escalante National Monument that the entire family can enjoy. The golden glow and towering canyons walls are magnificent. Trail Usage: Skutumpah road is impassible if wet. Sun Exposure: Sun and Shade mix. Trail Conditions: Skutumpah Road is remote and can be impassible if wet. Most of the Willis Creek hike is a nice stroll through a cobblestone stream. This is an easy hike that kids and families with enjoy. Best Season: Summer when the water is warmer. Willis Creek Trailhead - From Mount Carmel Junction, follow US Highway 89 north, to Glendale, Utah. Make a right turn on 300 North, also called the Bench Road. It's directly across the highway from the Buffalo Bistro. Travel the graded dirt Glendale Bench Road (road #600) for 15 miles to a marked junction in the road. There is a kiosk at the junction with a map and other information. The road goes in two directions from the Glendale Bench Road. One road is the Johnson Canyon Road and the other is the Skutumpah Road (road #500). Take Skutumpah Road. It's 14 miles on Skutumpah Road to the Lick Wash Trailhead. To find Willis Creek continue down Skutumpah Road 11.8 miles past the Lick Wash trailhead. There are two parking areas for Willis Creek. The trail starts on the opposite side of the road from the registration box. Willis Creek is a 4 mile round trip hike. 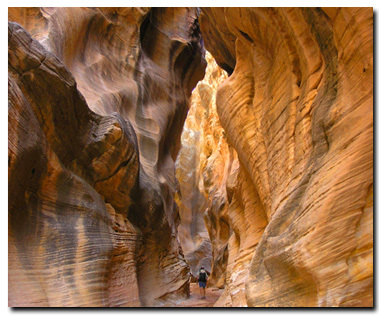 It's an amazing slot canyon adventure with narrow cliff walls and a flat, stony stream-bed path to walk through. Towering slickrock forms the walls of this incredible slot canyon. Some small waterfalls add to the fun and enjoyment of the Willis Creek hike. Willis Creek can be combined with Bull Valley Gorge for a two day backpack. Skutumpah Road - Continue another 3-miles northeast on Skutumpah Road to the GSENM kiosk. After the kiosk, it's another 3.5 out of the monument and onto the paved scenic backway to (Kodachrome Basin Road) Cannonville. There is a staffed GSENM Visitors Center in Cannonville. Caution: Flash floods are a danger with any hike through a slot canyon. As with Lick Wash hike, check weather information prior to hiking. Grand Staircase-Escalante Roads - Pristine and remote describes the roadways within the Grand Staircase Escalante National Monument. Highway 89 defines the southern border and Highway 12 accesses the northern side. In addition to Highways 12 and 89, there are 959 miles of open road in the Grand Staircase. Glendale, Utah, located on Highway 89, northeast of Zion National Park, connects the east side of Zion to Bryce Canyon via the Glendale Bench Road and the scenic backway, Skutumpah Road. To the north, Highway 12 connects Tropic and Boulder, Utah. At the southern end of the monument, roads connect Kanab, Utah and Page, Arizona. 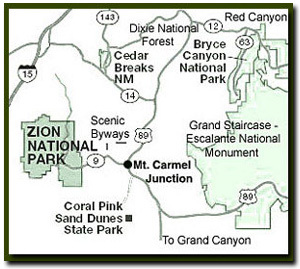 The most popular roads in the Grand Staircase are probably Skutumpah Road accessed either by the Glendale Bench Road, near the east entrance to Zion, or the Johnson Canyon Road near Kanab, both leading to Kodachrome Basin near Bryce Canyon. All interior roads except for portions of the Burr Trail and Johnson Canyon Road are unpaved and may be impassible if wet. Grand Staircase-Escalante National Monument - UTAH!